****We have discounted pricing based on longer stay. Unfortunately homeaway does not allow for discount pricing based on length of stay. 2-3 nights $2500 per night, 4 nights are $2200 per night and 5 night stay is $2000 per night. This is a must see home. 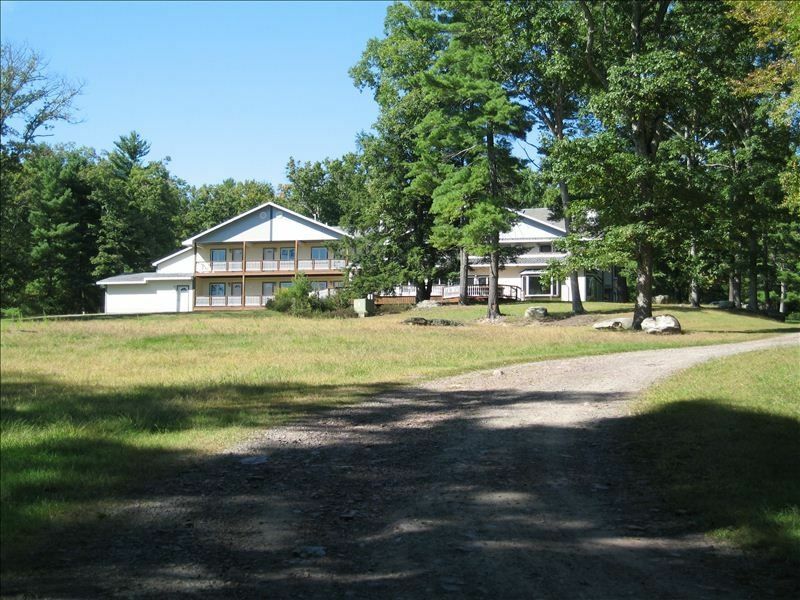 It is over 25,000 square feet and is situated on over 33 acres of land. It is a two hour drive from New York City, and is less than 1/3 of a mile to the Delaware River. It is an excellent property for family reunions, family gatherings as well as corporate events. The house is beautifully furnished. There are a tremendous amount of amenities at the house and on the property. The indoor pool is perfect for water volleyball and basketball. The pool is great for the little ones as it ranges from three to five feet deep. The pool room has a stereo system and a kitchenette. Other indoor amenities include: full size pool table, ping pong table, foosball, air hockey, shuffleboard, and a dance floor, complete with disco ball! The living room has a gas powered fire place, a 65" plasma tv with high def satellite, a blu ray and DVD player, surround sound, the Nintendo Wii, including many games and Wii fit. There is internet with wifi. Outdoor amenities include a full basketball court, fenced in softball field, two ponds with a small waterfall, shuffleboard court, paddleball court, and a nature trail that encompasses the 33 acre property. The house is about five minutes from Big Bear Mountain where there is skiing, snowboarding and tubing. In the spring, summer and fall months there are many places for white water rafting and kayaking. There are many deer and wild turkey that roam the property frequently. I am an entrepreneur, residing in New York City. It is close to my primary residence and offers an easy weekend escape for myself and my family. There is much to do, not only at the house, but also in the very nearby surrounding area. There is an outdoor full basketball court and fenced in baseball diamond on the property. There are also two ponds, waterfall and paddle ball court on the property. There is a 65' flat screen TV with blu ray player with a wii console. There is a fenced in softball diamond, basketball court, paddle board court and shuffle board court. Call for email for rates longer then 3 nights. 2-3 nights is 2500 per night, 4 nights are 2200 per night, 5 night stay 2000 per night. We do not rent to vacationing students or anyone under the age of 30. We require a contract to be filled out before your reservation is accepted. Owner has the right to refuse rental to anyone.